As an NGO with very strong links to Zithulele Hospital, a large and important part of our work is providing programmes which support and supplement the hospital's services. 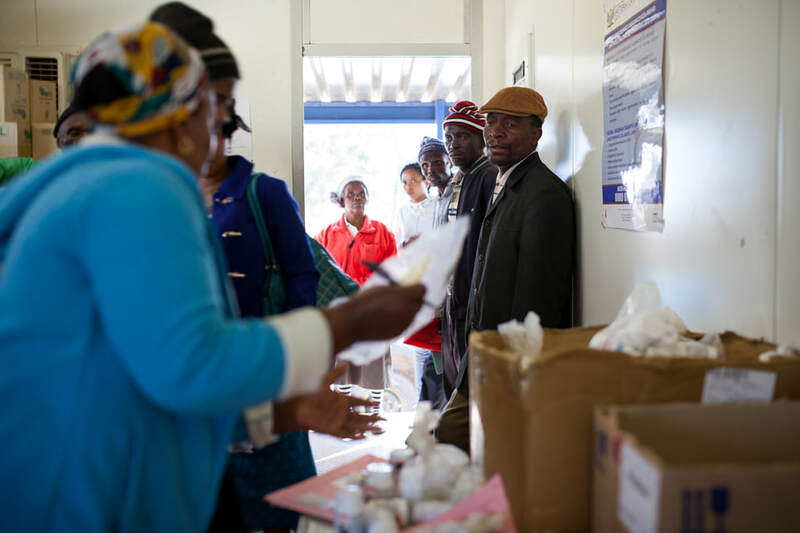 Jabulani works hand-in-hand with Zithulele Hospital and it's catchment Primary Healthcare Clinics, to ensure the continuation and strengthening of the HIV Programme. Our main role is one of supporting clinicians to maintain the standards set over the past 10 years, wherein the clinical and HIV programme staff have worked exceedingly hard to not only ensure access to care, but to ensure access to high quality care despite the resource-limited rural setting. In addition to prepacking, we continue to provide tailored support to patients, in order to ensure adherence to treatment. Specific measures are put in placed to support caregivers, children and adolescents, due to their particular vulnerability. Our continued work on the HIV Programme over the past year would not have been possible without grant funding from the Discovery Fund and the Anglo American Chairman’s Fund. We are also extremely grateful to the Donald Woods Foundation who generously donated to us the 4x4 vehicle that they had previously purchased when involved in Zithulele’s HIV/TB work. The doctors use this vehicle for daily visit to clinics. The TB Point Programme at Zithulele Hospital was initially set up in October 2008. Since June 2009, Jabulani has supported the programme through the employment of additional staff, in order to improve the quality of the service and monitoring. These Jabulani employees provide the vital but otherwise unfunded services of data management and quality counselling, enabling the measurement of accurate and up-to-date data, the follow up of defaulters and the initiation of HIV patients onto ARVs. Jabulani’s involvement in the TB Programme has decreased the TB treatment defaulter rate; increased the rate of patients with TB tested for HIV; and increased the rate of HIV positive patients who access HAART. Jabulani staff are also instrumental in the support and monitoring of patients with Drug Resistant TB, all of whom start ART as in-patients during their initial admission. We would not be able to do this without the generous funding from the Sonnevanck Foundation in the Netherlands. The biggest aspect of our on-going support of Zithulele Hospital is the employment of supplementary staff, who assist where existing staff are stretched and taking strain, or who take up roles that allow clinicians to focus on being clinical. In addition to the HIV and TB staff mentioned in previous sections, additional support staff we employ include 10 Clinical Team Assistants (previously called translators; name changed to reflect the diversity of their role), one pharmacy helper, one switchboard assistant and one OPD Clerk assistant. Our clinical team assistants facilitate good communication between clinicians and patients, thus contributing to improved health service provision and also provide assistance to ensure the smooth running of consultations in the hospital’s Out Patient Department and Casualty; our pharmacy helper provides stability in a department that experiences significant staffing level changes over the years; and our employment of an OPD Clerk Assistant has allowed continuity of Personal Assistant support to the Hospital's Clinical Manager, which has become a vital component to the on-going progress and development of the clinical team at Zithulele. In terms of providing consumables to support the hospital, we continue to try and get the balance right between supporting but not alleviating the Department of Health from their responsibility to provide resources and services. However, when procuring things through official channels proves impossible or poses a risk to getting the “job done” or the sanity of the clinical team, small interventions from our side can make a significant difference. This kind of support is particularly relevant for the Rehabilitation Department, whose work relies on their ability to provide assistive devices that often cannot be procured through hospital channels, and therefore must be made themselves, usually through purchased or donated materials. Please click here to learn more about the Rehabilitation Department and Therapy Department Support and how you can become involved in helping to realise dreams and create opportunities for those living with disabilities in our communities. We have joined up with Zithulele Hospital and the Health Department to provide self-catering accommodation on hospital land for pregnant mothers who are due to give birth imminently. With a hospital catchment area of 1000km², it is extremely difficult for many mothers who go into labour at home to get to the hospital in time. There are only three ambulances serving the area, so most patients have to make their own way to the hospital. Public transport is either too expensive or non-existent, and the sub-standard condition of the local roads makes travelling very slow. As a result, we estimate that around 50% of women in our area give birth at home. Delayed presentation to the hospital accounts for almost one third of avoidable perinatal deaths at the hospital. No data exists for how many babies die at home. The Waiting Mother's Accommodation opened in June 2009 and now we have clean, safe accommodation right next to the hospital for up to ten women at any given time.